Cardiff Fire's Hungarian forward Tamas Elias scored two goals - including the dramatic overtime winner. 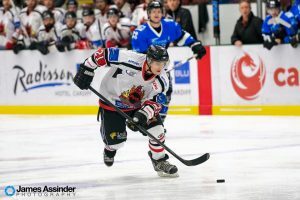 Cardiff Fire are ready to set the National Ice Hockey League alight during the 2018-19 season. Fire have one team playing in NIHL Division Two South and they open the campaign with back-to-back home fixtures at Ice Arena Wales. Basingstoke Buffalo are in Cardiff Bay on Sunday, September 23, while Slough Jets are at the IAW on Sunday, October 7. Fire have big ambitions for the new season and they have appointed former Slough Jets and Invicta Dynamos goalie Chris Douglas as head coach. Former Cardiff Devils defenceman Mark Smith is Fire’s head of player development, while Mark Cuddihy is director of hockey. Douglas, who had vast experience in the English Premier League, will continue to play and help in the development of young netminders James Whiting and Great Britain under-18 goaltender Lewis Davies. “As soon as I knew Chris was available I called him,” said Cuddihy. “Chris has a ton of experience having played in the second tier since he was a teenager. “He’s played on good teams and gathered a lot of knowledge. He’s a qualified coach and when I listened to his plans and vision for the Fire I knew it fitted in with what we are trying to do. “Last season was tough and we need to build the club up to be better prepared for Division One hockey. I couldn’t continue coaching and run everything off-ice if we are to succeed. “In Chris we have the perfect coach to take us forward, while Mark Smith and I will offer support and build for the future. “Chris isn’t done with playing and his performances last season, winning the all-star award, prove that. Douglas, who started his playing career playing for Cardiff Rage in 1997-98, has set a target for the team in qualifying for the play-offs and says: “With hard work from everyone there is no reason why we cant break the top four. “I had a few playing options this season, but once Mark spoke to me about coaching the team I felt that this was the right move for me. “Cardiff is where I started my senior career 21 years ago and it’s fitting that I start my coaching career in the city. “All of the teams seem to have strengthened and with only four play-off spots it is going to be a tough season. However, we have a great bunch of guys here in Cardiff with a good mix of experience and youth. Douglas, aged 39, has represented teams all over Britain including Hull, Peterborough, Romford, Swindon, Haringey and Bracknell in the second tier of British hockey. Over the past two seasons, Douglas has played in Slough for the Jets and won the NIHL Two all-star goalie of 2017-18. Director of hockey: Mark Cuddihy. Director of player development: Mark Smith. Great Britain and Cardiff Fire netminder Lewis Davies. Goalies: Chris Douglas, James Whiting, Lewis Davies. Defencemen: Ellis Sheppard, Phil Manny, Joe Morris, Tom Smith, Iwan Davies. Forwards: Sam Bryant, Tamas Elias, Alan Armour, Elliott Murdoch, Lewis Stevens.